Happy Easter to those that celebrate this holiday. Many Canadians will also be enjoying tomorrow off from work as they observe Easter Monday as a public holiday, a day off that we do not have here in the States. Because today is Easter and given the custom in both countries of giving candy to children on this holiday, for the last day of O’Canada Food Month, I thought I’d highlight popular Canadian candies. While I’m not a big eater of chocolate or other candy, it’s easy to recognize that among comfort foods candies occupy a special place, especially because they frequently bring us back to memories of childhood. Among the leading confectioners plying their trade in Canada is Cadbury and Nestle, both of which appear to dominate offerings of chocolate candies in Canada. I assume this is because of the country’s longer standing connection to and influence by Europe, where both those companies are based (Cadbury in England; Nestle in Switzerland). By contrast, while Cadbury and Nestle products can be found in the U.S., not surprisingly candies by U.S.-based Mars and Hershey are more common here. There are certainly many candies in common in both places — such as Snickers, Crunch, Kit Kat and Rolo chocolates — but there are quite a few products that can only be found in Canada. 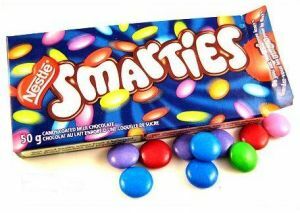 These include Smarties chocolates (similar to M&Ms and not to be confused with the tart candy wafers that bear the Smarties name in the U.S.), Coffee Crisp, Aero, Crispy Crunch, Maltesers and Wunderbar. Also worth mentioning are Kinder Eggs, which are hollow chocolate eggs with a toy surprise inside that, while not strictly a Canadian candy, are widely sold there but are oddly banned in the U.S. (due to possible choking hazards among very young children). Here in the States, Necco offers a line of mint candies called Canada Mints, but I’m not sure how popular those are in Canada. Nothing like going to Bulk Barn and buying a kilo of Smarties, so much better than M&M’S. Smarties rock! I love Aeros with a bit of a chill. Yum! Nice idea — next box of Smarties in the fridge for a while first.